They’re brainstorming viral campaigns, submitting budget proposals, developing websites, pitching to media and conferencing with clients—and that’s just during this week’s class sessions. 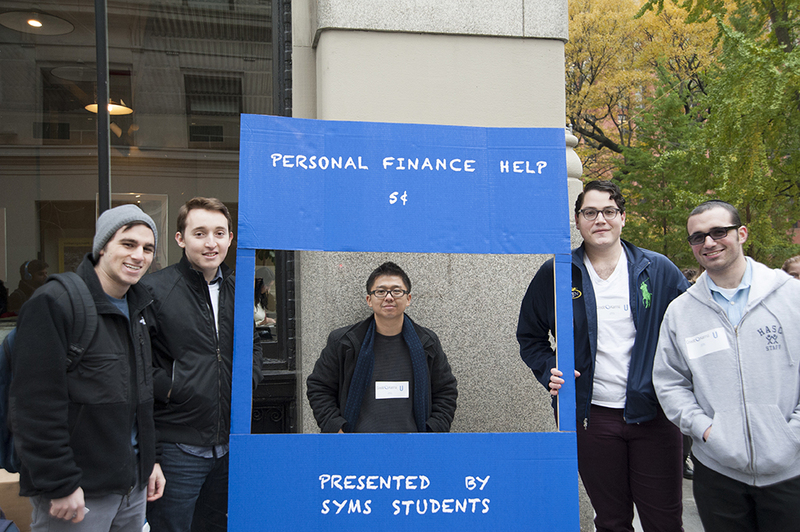 Sy Syms students in the Social Media Marketing course taught by Professor Steven Chan (center) offer personal finance help in Washington Square Park as part of their campaign. 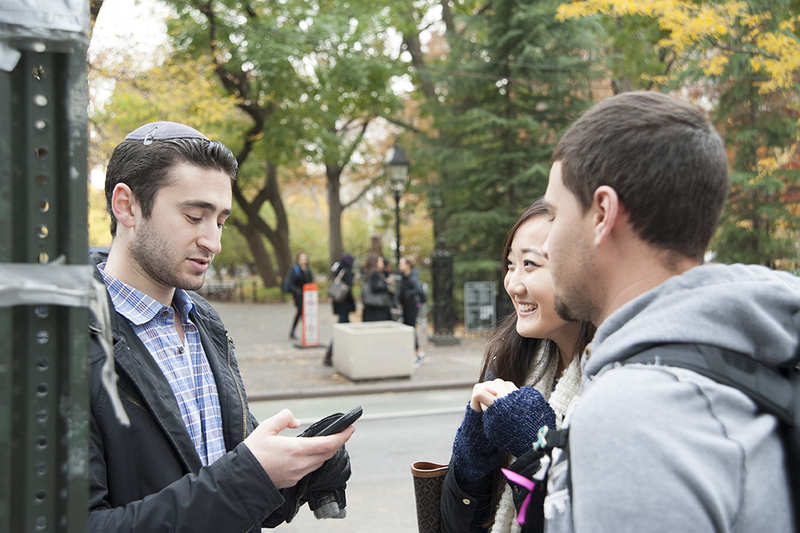 They’re students in the new Social Media Marketing course at Yeshiva University’s Sy Syms School of Business, and if their workload sounds more like a typical day at a marketing agency than a college lecture, it’s no accident. There are no textbooks and few required readings for this course. Instead, the class operates on one simple principle: learn by doing. As Chan considered different models for the course, a call from Jonathan Struhl ‘09SB, an alumnus who ran a hugely successful social media campaign at his first job out of college and went on to create his own agency, gave him an idea. So Chan turned an ordinary classroom into a campaign headquarters. In small teams, students develop strategies to help real companies and organizations see real differences in their marketing and brand awareness. Their client list is diverse, ranging from Pint Pal, a startup that makes cozies for ice cream lovers who like to eat straight from the pint, to the Young Israel movement, to an organization fundraising for Ebola research. The class is also collaborating together on a larger project: the Credit Karma Campus Challenge. Sponsored by Credit Karma and hosted by EdVenture Partners, the competition calls for students to create an integrated marketing campaign aimed at educating the target market—college students and young professionals—on the value of understanding and managing credit through the Credit Karma site and its resources, and driving them to become members. The class is given a $1,500 budget to implement their plan. If the Sy Syms students win, they’ll fly to San Francisco, California, and pitch their idea to top executives at the company. “It’s a win-win: the company is gaining brand awareness in college audiences, and students experience a real work atmosphere and are able to say, ‘I worked with this client and implemented a successful campaign,’ ” said Chan. So far, their strategy is as expansive as it is unexpected, including everything from a feel-good viral campaign that dares social media users to pass along acts of kindness (“Good karma, good credit”) to a social media scavenger hunt around campus. The class also set up a whimsical, Peanuts-style advice booth in Washington Square Park this week where passersby can seek personal financial help and learn more about Credit Karma. All that field work on campaigns is contextualized by guest lecturers like Struhl, who share their own experiences in the evolving world of social media and marketing, and insights into consumer behavior and social psychology drawn from Chan’s background in management consulting and academia. Check out upcoming events on campus for the class’s Credit Karma campaign.